In 2017, the Munich hub from the World Economic Forum Global Shapers conducted a survey with 253 people. This survey was meant to better understand how people perceive Munich when it comes to environment and climate change. Results are now available and very positive for the Bavarian capital city. 80% of the respondents found Munich better or even much better than other cities when it comes to the environment as well as green aspects like air quality, cleanliness or green spaces and parks. 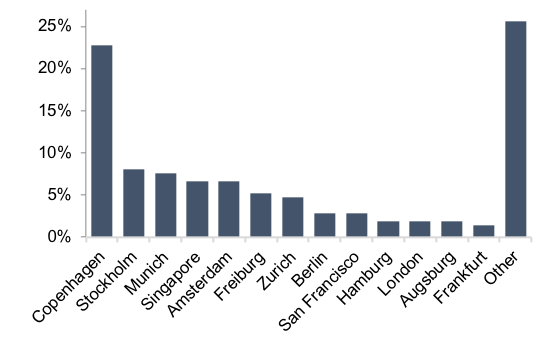 16% found Munich in the average of other cities while only 2% experience the Bavarian city as worse. This positive trend was even stronger for non-German people: 87% of them found people better or much better than other cities and no one found Munich worse. Green spaces add to Munich's likability whilst traffic induced pollution, especially in the inner city, are seen as negative. Munich scored very well on different aspects which could define a green city: parks and green spaces are very well ranked, so is the overall cleanliness of the city - despite a number of trash bins which could be improved for some respondents. There seems to be some room for more shops selling organic and/or sustainable products despite the acknowledgement that the offered products improved the past months. Transportation is the main area where Munich could improve for 74% of the respondents, first by reducing the number of cars, especially in the city center (28%) and by better encouraging cycling (18%) as well as public transportation (16%) through better infrastructure and lower costs for the citizens. The traffic aspect is particularly highlighted by people who do not originally come from Munich, Germans (30%) or foreigners (38%), whereas the traditional Münchner seem less annoyed (11%). Less than 50% of the respondents solely use public transportation or their bikes while 50% never do car sharing, explaining the high number of cars in the city. Beyond mobility, even if parks are seen as a great asset for Munich, 11% of respondents would like to see even more green spaces and especially urban gardening areas in the city, on the roofs or in some parts of the city. The need for local food and seasonal food is high with more than 55% of the respondents eating often or always local and/or seasonal products. Compared to other cities, Munich remains a role model, together with the Scandinavian cities like Copenhagen and Stockholm, posterchildren for sustainability, bike-friendliness and organic shops. Copenhagen is mentioned by all groups while Stockholm is especially mentioned by people not originally from Munich. In Germany Munich leads the pack, followed by Freiburg. Zurich, often well-ranked on sustainability criteria, does not make it to the top five but is still seen as a green city. Climate change is a challenge for almost everyone and environmental aspects are part of the decision on where to live. 94% of our respondents see climate change as an important (25%) or very important (69%) challenge for today's society and 74% consider the sustainability aspects of a city when deciding where to live. This clearly highlights the need for environmental consideration when planning cities, not only for the sake of the environment but also to make citizens happy. This is unfortunately less true for tourists who seem to be less interested in these aspects, only 23% considering them at least important when choosing a city to visit. The Bavarian capital ranked overall very well when it comes to environment and sustainability. This is a key asset that Munich should promote even more, especially when we know how important these aspects are for citizens, together with climate change. If there were two things Munich should focus on, we would say traffic and mobility and to a lower extent green spaces and nature. The main question remains how. We believe positive incentivization and enlightening education could be the key.